Two London rivals face off at Wembley in the FA Cup final on Saturday and it promises to be a thrilling tussle. You can watch every minute live on BBC1 and it is a match you won’t want to miss. Chelsea vs Arsenal kicks off at 17.30, and both teams will be desperate to get their hands on the famous old trophy. If you are having a bet, check out our preview and exclusive prediction below. Before you put your money down, you should check the best available free bets and promotions. The Blues won 3-1 the last time these two London rivals met. The Blues cruised to the Premier Title with consummate ease, and Antonio Conte would love to complete the double. They finished top of the table with 93 points, 7 points clear of their closest rivals Spurs. Chelsea have won four in a row and they beat Tottenham 4-2 in the semi final of this competition. They are warm favourites for victory on Saturday, but they won’t have it all their own way. Courtois will start in goal for Chelsea and he is a ‘keeper with huge potential. He has had a fine season, but he has had plenty of protection from his three centre backs. Cahill, Luiz and Azpilculeta have gelled well at the heart of Chelsea’s defence and they complement each other well. Alonso and Moses have been revelations on the flanks, and Chelsea are a tough team to break down. Eden Hazard was written off by many after a poor season last year, but he has bounced back to form with a vengeance. Kante has played a massive part in Chelsea’s success this season and not much gets past him in the engine room. Costa has also returned to his best up top and the Arsenal defence will need to keep a close eye on him this Saturday. Speculation about Arsene Wenger’s future has dominated the discussion leading up to the FA Cup final. The French manager is under pressure after his side missed out on the top 4. They were only 1 point behind Liverpool in 5th place and some fans are desperate for change. They battled to a 2-1 win at City in the semi final, but they are without some key defenders on Saturday. Cech will start in goal at Wembley and he has had a decent season between the sticks. Wenger started with 3 at the back vs Everton last week, but he is without Gabriel, Mustafi and Koscielny on Saturday. Holding and Mertesacker could start at centre back and a lack of pace could be an issue. Bellerin and Monreal will need to cover on the flanks and help out their centre backs when required. Alexis Sanchez almost single handedly dragged Arsenal into the top 4 with some superb displays. The Chilean hasn’t let speculation affect his performance levels and he could be the difference maker at Wembley. Ozil has not been consistent enough, and the same could be said for new signing Xhaka. With Chamberlain injured it could be a chance for Walcott to shine, and Wenger needs all his big names to deliver on Saturday if Arsenal are to lift the FA Cup. Injuries Suspensions Arsenal: Cazorla, Chamberlain, Mustafi, Koscielny, Gabriel. Chelsea: Courtois—Moses Azpilculeta Cahill Luiz Alonso—Kante Matic—Hazard Pedro—Costa. Arsenal: Cech—Bellerin Holding Mertesacker Monreal—Xhaka Ramsey—Ozil Sanchez Walcott—Welbeck. Chelsea: 4/5 Betfred. Draw: 59/20 Marathonbet. Arsenal 15/4 Paddy Power. These two teams know each-other well and they have won one each when facing off this season. Chelsea are deserved favourites, but they have surely been celebrating their Premier League triumph and they could be the worse for wear on Saturday. Arsenal desperately need to win a trophy, and we think they can get their hands on the FA Cup on Saturday. 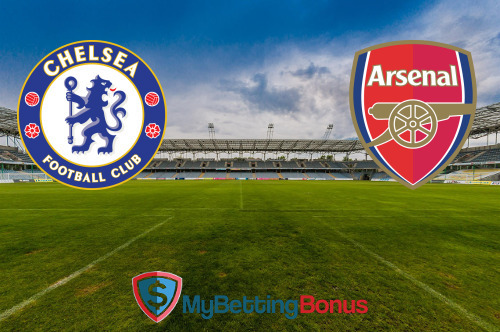 Our exclusive prediction for Chelsea vs Arsenal is for Arsenal to lift the cup at odds of 15/8 with Ladbrokes, who offer a fantastic £50 sign up bonus to new customers. 18+. New customers only. Promo code 'F50' required. Certain deposit methods excluded. Min £/€5 on win or each-way bet excluding Tote or pools = match max £/€50 free bet. Min odds 1/2 (1.5). Bet must be made within 14 days. Free bet valid for 4 days. Free bet stake not returned. Single bets only. Free bet cannot be used on certain markets. T&Cs apply.